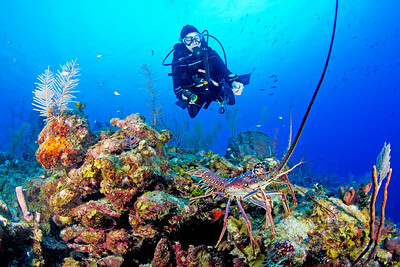 A collection of my favorite images from various "Wetspots" including Belize, Turks and Caicos and Roatan. 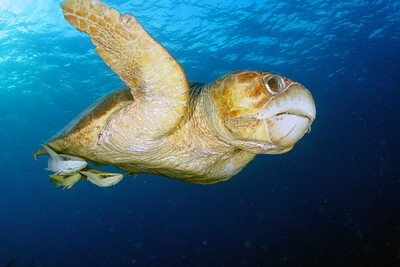 But resists, given the strict poaching laws in Belize! At perhaps 250 - 300 pounds and 100 years old, these critters is always a treat! 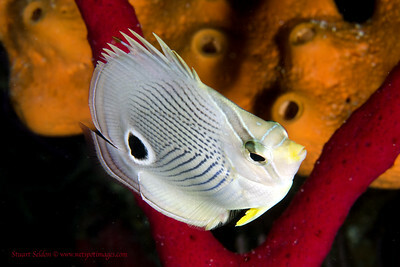 Juvenile Gray Angel... 3cm long! 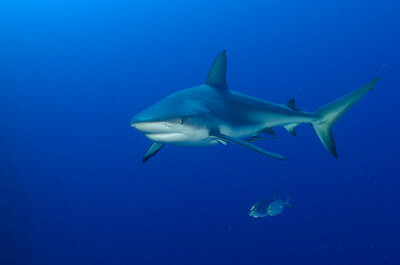 The outer cayes of Belize are home to several species of sharks, including hammerheads, grays, blacktips and bulls. This one followed us up from Halfmoon Caye Wall and kept us company buy making several close passes while we decompressed in the flats! Sadly, in March of 2016, illegal fishing claimed the lives of several sharks here, but this one, a tagged female, escaped the poachers gill nets. 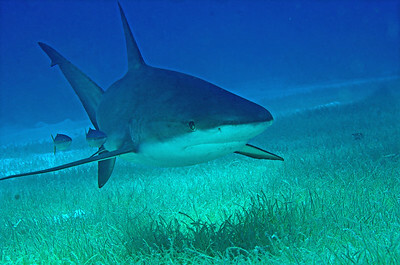 A reef shark, at Halfmoon Caye, Belize. 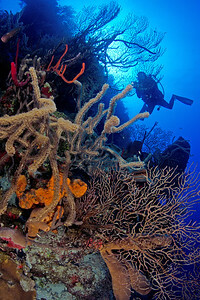 These are residents of these reefs and always exciting to see! A Rosy Razorback.... best named fish! 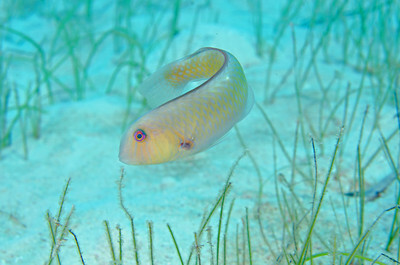 These guys are found in the sand flats, and quickly dive into their burrows when disturbed. 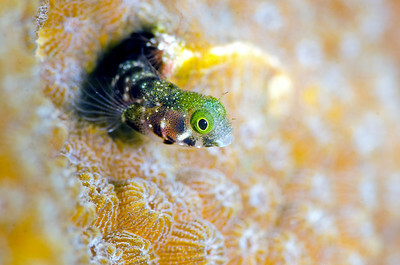 Sailfin Blenny... a tiny resident of the reef. 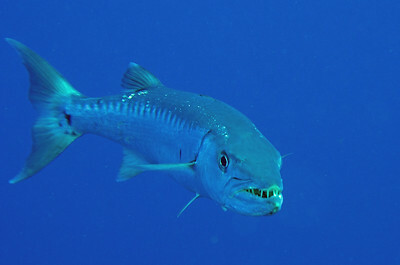 A barracuda shows his best menacing look! 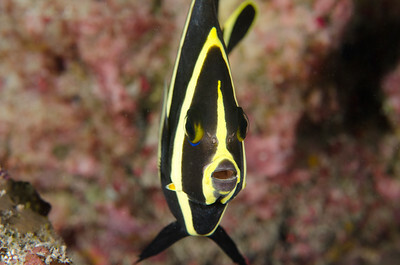 While not generally dangerous, these fish are worthy of a little caution. 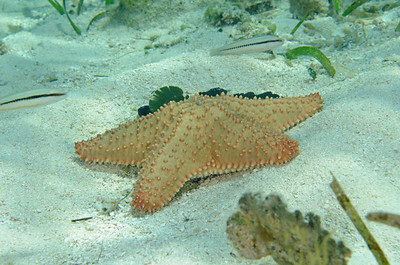 A starfish... Doing whatever it is that starfish do. 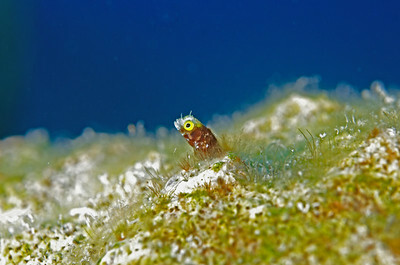 Roughhead Blenny... about 3mm showing. 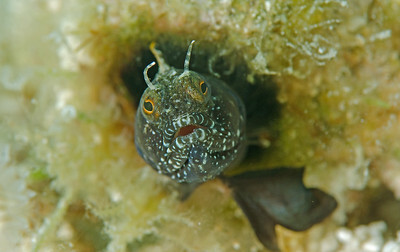 These little guys rarely leave their burrows and rely on currents to bring them food. Southern Stingrays are frequently accompanied by these Bar Jacks. 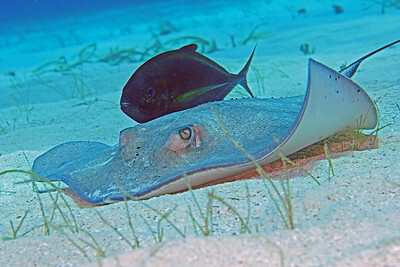 The Jack scrounges small fish as the ray forages for food in the sand. 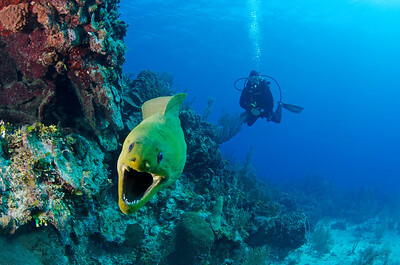 This green moray appears to have mistaken me for lunch. They have poor eyesite, so need to get up close and personal at times, but it's best to keep your fingers hidden! These tiny guys are challenging to shoot, but at least they don't swim away! His head is about the size if the tip on a wooden match stick!